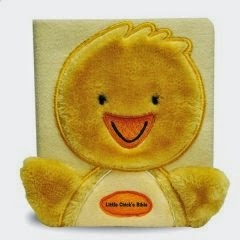 The Little Chick's Bible is a wonderful Bible story book for the youngest children. It is soft and cuddly, with a plush chick on the cover. Children can pet the chick, open and close his beak, flap his little wings. This book is immediately child-friendly and accessible to a small child. This is a board book designed for preschool children. There is a page with a short rhyming verse that tells a Bible story, and on the opposite page there is a lovely illustration of the story. Stories in the book include: the Creation, Noah's Ark, Baby Moses, David and Goliath, the Nativity, compassion to a neighbor (Luke 10:25-37), the miracle of bread and fish, the Resurrection. Only Noah made God glad. God said, 'Noah, build a ship. God made it rain for forty days. Still Noah always gave God praise. And wrote his promise, cloud to cloud." The illustrations are exceptional. They are bright and colorful, with details that will appeal to children - cute animals, nature, warm and interesting faces on people. I would recommend this book highly as a gift, as a Sunday School teaching tool, or as a great read aloud for a preschool classroom. PJ Lyons received a Master's Degree in Writing for Children at Vermont College and is the author of The Little Lion's Bible, The Little Lamb's Bible, and The Wonderful World that God Made. She currently resides in Grand Rapids, Michigan. 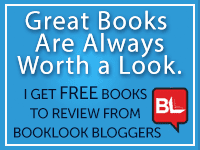 I received this book from BookLook Bloggers in exchange for an honest review.